Broadly, the median IRI ratings for all business plan networks in the Federal Aid System fall within “Good” or “Excellent” ranges. Non-NHS roadways with less than 2000 ADT have seen overall improvement. In 2014, the median IRI rating in this business plan network fell into the “Fair” range. At the time of the writing of this plan, it has improved to the “Good” range. Looking at the overall comparison of pavement quality in the HATS region, there has been improvement. Fair and poor segment miles have seen a slight decrease while Excellent and Good segment miles have seen an increase. Between 2014 and 2018, there has been an improvement of approximately 35 “Excellent” segment miles on Federal Aid roadways in the region while “Poor” segment miles have seen a decrease of the same amount, most likely due to recent resurfacing projects. In terms of bridges, the region continues to be in good standing in regards to District targets in all areas except for poor condition bridge deck area on the NHS Non-Interstate network (BPN2) and on the local network. HATS will move forward with a focus on bridges in these particular networks and continue to find resources to address bridge needs. As part of PennDOT’s 2017 Extreme Weather Vulnerability Study, a risk score is assigned to state-owned roadways and bridges at risk from floodwaters. This score combines variables of precipitation, floodplain location, reported past closures, bridge scour, deficient pipes, road classification, and traffic volumes. The highest possible score is 100 being the most vulnerable. Road Condition Reporting System (RCRS) events from 2006-2015 and stakeholder comments were combined to identify the vulnerable areas. 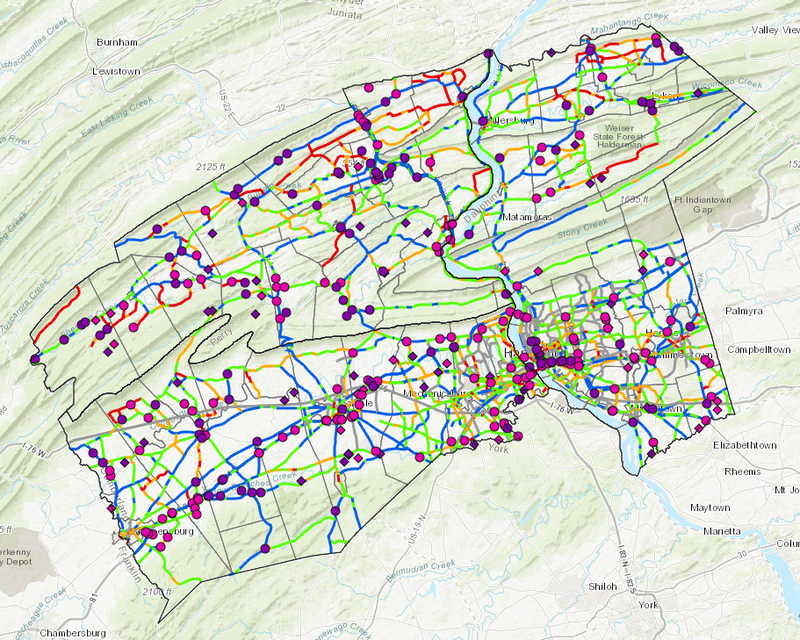 See the PennDOT Extreme Weather Vulnerability Study for more information, data, and statewide maps. In 2017, Dauphin County received a $2 million grant to implement the $5 registration fee to address county bridges. Cumberland County also recently received state funding to complete one of their local bridges through PennDOT’s LaSeR initiative. When released, coordinate with the necessary agencies to work toward applicable performance targets for pavement and bridges.